My name is Nicholas Kinnear, and I am currently serving as the President of the Oklahoma Beta Chapter of Sigma Phi Epsilon at the University of Oklahoma. 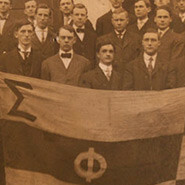 SigEp is a place committed to the development of talented young men. Our goal is to push our members to be the best they can be in every area of life. We pride ourselves on having a welcoming environment that encourages the building of lifelong relationships. We place a large emphasis on academic success. In spring 2016, we achieved a 3.3 overall GPA, which was the best among any fraternity at OU. Our chapter GPA is routinely among the highest in OU IFC, as we hold our members to a standard of academic excellence. Our philanthropies have been extremely successful as well. The 2017 “Coffee House” benefit night, we, along with the outstanding ladies of Delta Delta Delta, raised nearly $10,000, benefitting the St. Jude Children’s Hospital. For the 2016 fall semester, we partnered with “Mary’s Meals USA”, a non-profit organization that focuses on providing the means for schools within third-world countries to provide meals at school, enticing children to attend school and receive an education as well. For $20, Mary’s Meals can feed a child for a year. We were able, as a house, to fundraise the means to sponsor 85 kids for one year. Regarding intramurals, we’ve won the overall fraternity championship two of the past three years. In the 2016-2017 school year, SigEp placed 1st and 2nd in flag football and 1 st in soccer. Our alumni base is one of the strongest in the entire country. We are currently undergoing a capital campaign with the goal of renovating the entire house. The basement and 1 st floor of our house underwent a state of the art renovation in 2015, and we are working towards completing the entire project in the near future. It’s an exciting time to be a SigEp.